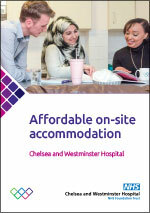 The Trust offers on-site accommodation at both Chelsea and Westminster Hospital and West Middlesex University Hospital sites. What could be more convenient than having a 5-minute or less commute to your place of work? 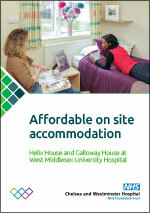 Doughty House at Chelsea and Westminster, and Helix House and Galloway House at West Mid offer comfortable, independent living at enviable prices for London. Please note: There is no family accommodation on site. A deposit of one month’s rent plus the first month’s rent is required to secure a room. Please contact the accommodation office and ask for an application form.